It looks like fire season has arrived in Alaska. There are Red Flag Warnings for high fire danger in effect throughout the Interior until 10 p.m. today due to warm temperatures, low relative humidity and strong winds. 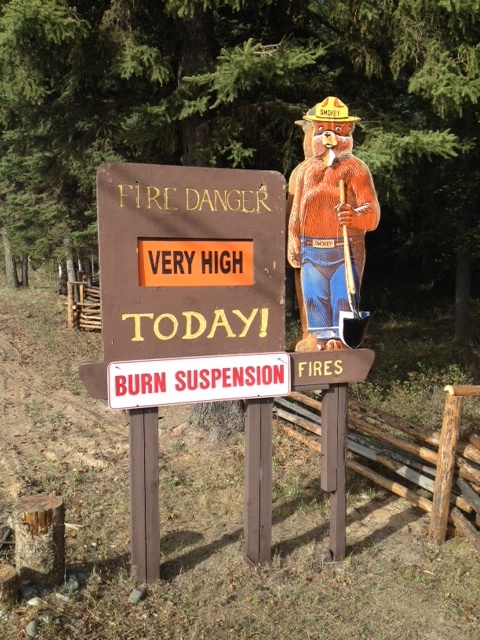 There are burn suspensions in place in the Fairbanks area, Delta, Tok, the Copper River Basin, and Denali. The Red Flag Warnings and burn suspensions are expected to be extended through the weekend as conditions remain warm and dry. With no significant precipitation yet this spring and greenup still in progress, conditions are extremely dry and vulnerable to wildfire, especially in areas with cured grasses. Temperatures are forecast to be in the mid-70s through the weekend with the relative humidity expected to drop into the low teens. In addition, the National Weather Service has issued a wind advisory for the Delta area south of Birch Lake until 6 a.m. Saturday. The forecast calls for winds of 25 to 40 mph with gusts to 50 mph. Those conditions provide the potential for extreme fire spread in the event of a wildfire. The burn suspension pertains to all open burning, including agricultural burns. Campfires and approved burn barrels are not included in the burn suspension but the Division of Forestry urges everyone to use caution when it comes to any kind of activity that could lead to a wildfire. For more information or to check on the status of a burn suspension, call your local forestry office or go online at http://forestry.alaska.gov/burn/.